British dairy farmers are once again protesting over the low prices on offer for their milk. They worry that too many producers are going bust, and that long-term milk supplies are at risk. Supermarkets are usually cast as the villains in this piece and this time it is no different. Farming unions are meeting Morrisons to ask for a fairer deal – and protesters in Stafford even took two cows into an Asda branch to help make their point. However it is too simplistic to blame the supermarkets – the real problem is global. Too much low-value milk is being produced around the world. Over the past decade, UK milk production averaged 14 billion litres per year, of which around 500m litres are exported. Just 139m litres are imported. 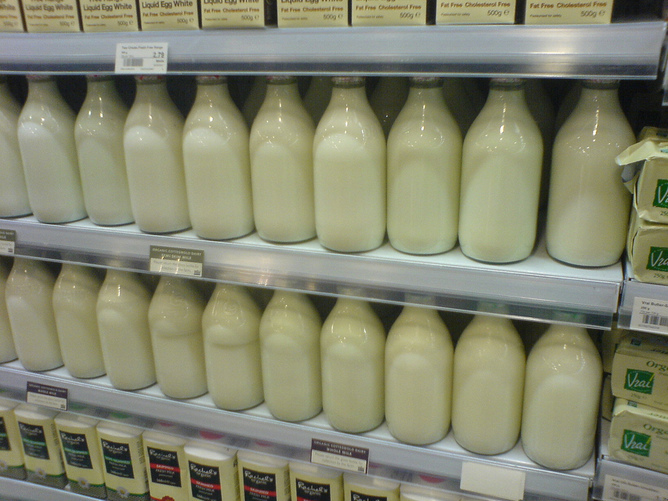 Milk made in the UK tends to stay in the UK. What happens to that 14 billion litres? Nonetheless the number of dairy farmers continues to decline, from 40,000 at the start of the 1990s to 14,159 in 2013. This is alarming to some, but it shouldn’t be. For long-term security of milk supplies, it doesn’t really matter how many dairy farmers pack up production. The cows often move to another farm and it is easy enough to step up production through more intensive feeding and selective breeding. After all, even though the total number of cows in the UK has halved since the 1970s, production has remained steady thanks to the fact average yields have doubled. Farmers are literally squeezing more out of each cow. Half of domestic milk production has to be diverted from the more lucrative liquid market into cheese, yoghurt, ice cream, butter and other manufactured products. This is partly because people drink a lot less milk these days; from five pints per week in the 1960s to around three pints today. Consumption is down 8.1% in the past ten years alone. Any industry would struggle in such circumstances. This supply and demand problem is replicated across the world – and there is currently a massive oversupply of manufactured milk products on world markets due largely to increased production in China, India, Brazil and New Zealand (where they are dealing with similar issues). This surplus, combined with a collapse in global demand especially in China, has depressed prices. A Russian import ban in retaliation for EU action over Ukraine has also hit prices. Russia used to buy 27% of the EU’s cheese exports and 19% of its butter. The Global Dairy Trade auction, the industry’s main dairy commodities index, hit a 13-year low in August 2015. The GDT has now lost 64% of its value since a record high in February 2014. The amount paid to farmers – the UK’s farm gate price – has declined sharply since early 2014 to just 23.66p per litre. When it costs farmers around 30p to produce each litre, it’s easy to see why they are annoyed. The major milk processors have to balance their operations across the various markets they sell in and, as a consequence, pay dairy farmers an average price. Farmers will not get, and should not expect to get, the supermarket price for liquid milk. 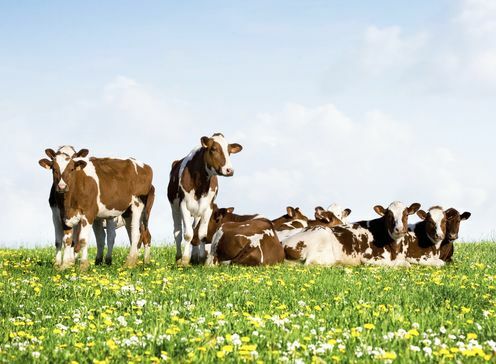 Some supermarkets – Tesco, Marks & Spencer, Sainsbury’s and Waitrose – have agreed direct contracts with dairy farmers that allow them to recover their production costs, but these only involve a small number of farms. Retail supermarket prices for liquid milk are much higher than farm gate, at typically 55-60p per pint (£1.30 or so per litre), but there is no evidence that milk is being used as a “loss leader”. Four pints for 89p at Asda is probably as low as they can get, but the price spread is understandable, appropriate and market-justified; we can’t just hold supermarkets alone responsible. If there is a villain in this piece, it is the world market. With too much supply and not enough demand, farmers have two options. Those near big cities can opt out of the globalised milk market through establishing farmer co-operatives to supply just the local area where they can possibly charge higher prices. Or they can seek high-value, niche markets such as yoghurts, farm-produced ice cream and organic milk. One other way of dealing with supply-demand imbalances would be to bring back dairy quotas, at least at lower levels. The EU introduced quotas in 1984 to control milk production and eradicate butter mountains but they were abolished in April this year. The problem currently facing the British dairy industry is that it is easy to produce milk in the UK’s green, wet and pleasant land, but it is very difficult to find profitable markets for 14 billion litres of the stuff. Until dairy farmers resolve this overproduction dilemma, many will continue to go out of business. Uneconomic dairy farms, like uneconomic coal mines, must close down and the adjustment process is harsh and painful for farmers and miners alike. In today’s highly globalised world a more humane outcome is unlikely. John Lingard does not work for, consult, own shares in or receive funding from any company or organization that would benefit from this article, and has disclosed no relevant affiliations beyond the academic appointment above.